« How hard could it be? 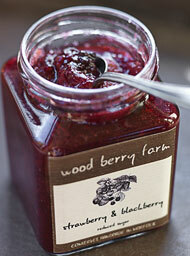 I think you could be a convert to Woodberry Farm……I’ve finished my jars and need to restock…they are to die for! Lovely that you are flying the flag for Norfolk foods…we have the best local produce around. I’ve never been a huge jam-on-bread person, but I can see porridge is where jam-esque type things, like low sugar compotes, could be very handy. Hopefully Catriona will be at North Creake Farmer’s market and I can buy some. If not I know Norfolk & Suffolk Local Food Direct will have them, and Back To The Garden stock them too. Honey, there must be local honey available? And what about nuts? Kent has cobs what does Norfolk have in the way of nutty things? Honey is no problem. Except of course that the beekeepers are struggling here as everywhere because of the hive die-off. But I have my sources! I tend to have fruit in my porridge, seems to keep the energy high going longer, but I love toast and honey. We have nuts in the hedgerows, but I’m not aware of anyone doing it any as a business. May well be proved wrong though!